The Secondary School of Applied Arts is located in Uherske Hradiste in southern Moravia, Czech Republic. Students specialise in photography, industrial and graphic design, painting, sculpture, ceramics, fashion design, toy design, and shoe design. Students choose one major area of arts to study for four years. Also, they have classes in the Czech language, the history of arts, mathematics, chemistry, physics, sociology, and computer technology. There are approximately 240 students that attend the secondary school. 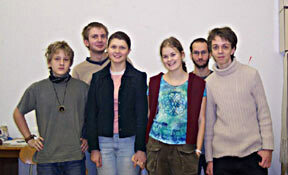 These students come from all over the Czech Republic. Since September 2004, Ms. Theresa Cohen has been teaching English conversation at the school. In January, 2005 the students read copies of Silver International and decided to introduce themselves to Silver International readers. Our school is a big old yellow building in the center of Uherske Hradiste which lies on the Moravia River in the Czech Republic. When you come you can see big stone stairs leading into the building. There is a ground floor and two floors above. There are seven subjects taught in one building and one in another. I study painting. This year we painted geometric advertisements on glass and portraits. We are very busy now because it is the end of the first term. My nationality is French. I have been living with my family in Czech Republic for seven years. I started to study at the art school two years ago. When I started I didn’t know what I wanted to do. Now I am seeing my future more clearly. When I finish at this school I will do graphics for a company. I come from Rosnor pod Rodhostem from the center of Moravia. I study graphic design, art history, and drawing. I play in a rock punk band and I am an imperialistic rebel. I like having an American English teacher because it is much more interesting and funny than when we have a normal Czech teacher. I study painting. I like it, but have little ambition for my future as a painter because it is a difficult and competitive career. I wish to become famous. I think Ms. Theresa Cohen is fine, but it is difficult to speak with her because I do not know a lot of new words. I am 18 years old. I study graphic design. I like having an American English teacher because I can talk more and do less grammar. I am not afraid to speak English now. Ahoj! I come from Velke Bilovice. This is a famous wine region. My family makes wine. I have many friends. I play in a band called “Wailing Odessa.” One of my friends plays drums and I play the guitar. I study painting, but I am more interested in film and music. Dobry Den (Good day!). I am from Uherske Hradiste, which is 300 kilometers from Praha. I study painting because I want to be a painter. I like having an American English teacher because I can practice conversation. I am from Liskovec. I study industrial design because I love to create new things. In my free time I work in a pub. I organize concerts or meetings for people. I like snow boarding, swimming, playing piano, and listening to music. I am from Czech Republic. I specialize in fashion design. I like to draw, make dresses, and paint. In my freetime go dancing with my friends, ski, and watch TV. I was born in Breznice in Czech Republic I study shoe design in Uherske Hradiste. I believe in the world there are enough nice and quality shoes. I will be the best designer of shoes!!! . In my free time I drink coffee. I like to go to parties and play tennis.